Opus 102. Composed by Dmitri Shostakovich (1906-1975). Arranged by Marco Pontini. Full score. Duration 19:00. Published by Baton Music (BF.BM439-SCORE). 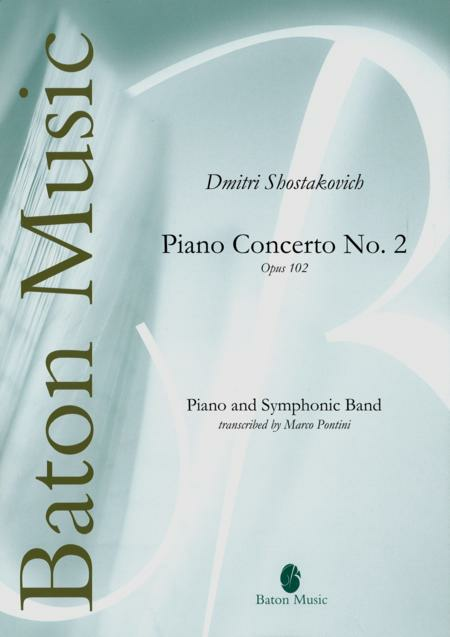 Dmitri Shostakovich wrote his second piano concerto in 1957 as a birthday gift for his 19-year-old son Maxim who premiered the piece during his graduation at the Moscow Conservatory. The eager, brilliant tone and brisk tempos coupled with repeated notes similar to a bugle's call in the first and third movements are likely the reason for the Disney artists having chosen to use excerpts from this concerto in the Steadfast Tin Soldier segment of the recent movie 'Fantasia 2000'.